I was recently given the book Cooking with Beer, written by cook/brewer/dancer Paul Mercurio. I’m not much of a cook, so I wanted to ease my way into the world of beer cooking. 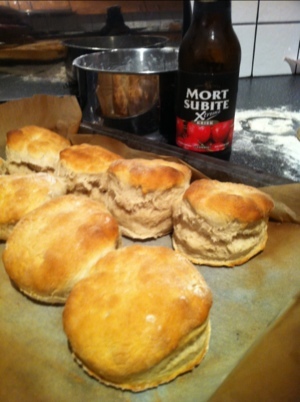 It’s no surprise then that a recipe named really simple fruit beer scones really spoke to me. Considering there were only four ingredients, getting them wasn’t hard at all. There was already castor sugar in the cupboard, and flour and cream were easily hunted down in Wollies (along with some jam to go on top). The most difficult ingredient was the beer. Officially recipe calls for a bottle of Timmermans Fruits de la Floret, and I have no idea where I’d get a bottle of this in Brisbane (any that knows, drop me a line). So I was planning on grabbing a bottle of Timmermans Framboise instead, since I know it roams the aisles of Dan Murphys. However when I got to my local I found that all bottles of Timmermans had mysteriously disappeared off the shelves, so I settled for a bottle of the Mort Subite Xtreme Kriek instead. Total cost for ingredients (including the optional jam) was about $12, with ample supply to make multiple batches. I was terrified at the thought of baking – I had visions of me covered in an explosion of flour and dough with the kitchen quietly burning in the background. But my fears were unfounded…turns out baking is dead easy. The flour was sifted, ingredients combined, the dough was kneaded and cut, placed in the oven and before long the house was filled with the smell of fresh lambic scones. The most difficult part of the whole process was whipping the cream to go with the jam on top. Despite my girlfriends suggestion to use to food processor, I took the more ‘masculine’ approach and whipped it by hand. Half an hour later (twice the time the scones took to cook! ), the cream was whipped. I was surprised by how much flavour the beer gave the scones. Overall they still had that real scones-like-grandma-makes smell and flavour that everyone knows and loves, but there was a definite sour-cherry thing happening that worked well…especially when coupled with the cream and strawberry jam. I’m not a huge lambic fan. This one tasted of surprisingly sweet cherries and finsished with a nice bitterness, and not as sour as expected. A bit of a lolly-water beer in my opinion – but it makes good scones! ← A sure fire way for Aussie craft brewers to get themselves some FREE advertising!